I finished another jumper. This has been on the needles for some time. Let me explain. I said I would explain, but I don’t really have an explanation. I must have just put this to one side to knit something else first and it somehow snowballed. There was nothing wrong with the pattern, nothing wrong with the yarn, all that was wrong was me. Apparently. The pattern is Viking Knots and the yarn is Drops Alpaca. I made the long sleeve version. I love that yarn and the fabric it produces. 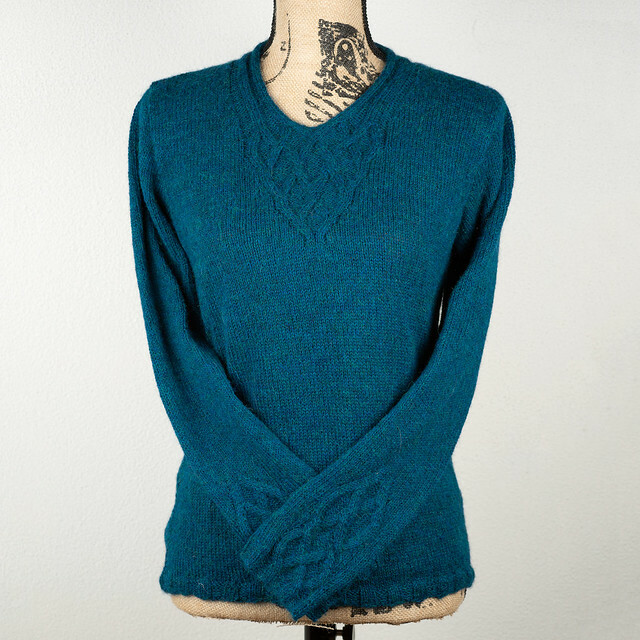 It’s very soft and it feels really substantial and yet the whole jumper weighs only 310g. When I was finishing the knitting, I was convinced it would not fit me. The fabric was so thin and the edges curled up so much that I thought it would fit a doll at best. When it was blocked and finished, the size is perfect! Everything about this jumper is perfect, except the knitting time. The colour I used is petrol (mix 7240) and it’s fantastic. I’m toying with the idea of knitting another Viking Knots. I’m drooling over the different colours of Alpaca: dark olive, dark purple, light maroon, rust, golden rod…how could I decide? What if I took another 11 years to finish it?